Hey, what’s going on everyone? 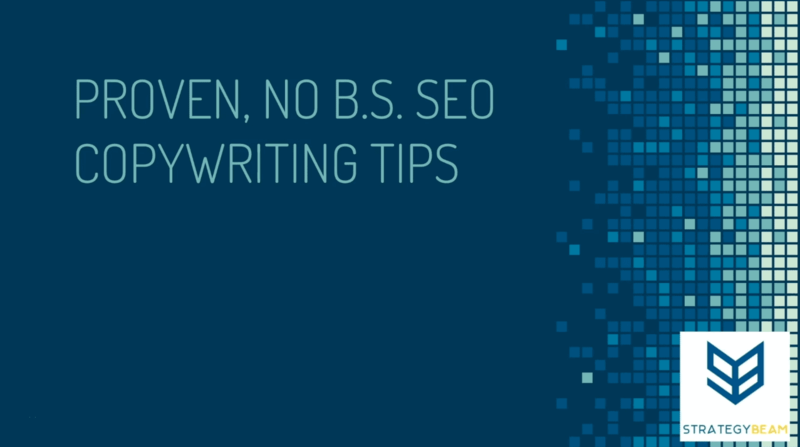 This is Chris from StrategyBeam, and today we’re going to look at some proven no B.S., SEO copywriting tips that I use for my clients and even for our marketing efforts here at StrategyBeam. You can use these tips for your small business or startup and see immediate results, so let’s jump into it. The first thing we always want to remember is to write for humans, and then optimize for robots. I think a lot of SEO copywriters, marketers, and business owners still think about how to game the system and how to manipulate algorithms to increase their online rankings. However, when it comes down to it, high content has to benefit your readers. This is because readers give you money, Google doesn’t. The only way to make great content is to think about how your content is being consumed. This includes who, what, when, where, and why. Who breaks down the segments about who’s looking for your content, men, women, age, demographics, things of that nature. What is a specific question? When are they looking for this? This dives into seasonality. We looked at seasonal SEO factors. How to discover, optimize and publish content in a previous video, so go ahead and take a look at that if you need to. Not only geographic but also are they on the go? Are they looking at your content on mobile devices and if so, how do you optimize that content for that consumption. Considering the WHY of your business and customers is an important part to build a strong online SEO marketing strategy. This is the big question because user intent is the most important thing when it comes to SEO. Why are people looking for your product or service? Why are they looking for your business? Why are they in the market for your solutions? We need to understand all five of these components to make significant content, and the only way to do that is by focusing on your reader. So you always want to focus on your reader. Then help robots understand your content with SEO, when it comes to the end of the day, the ranking is always less important than banking. It’s great to be number one on Google for a search term, but if you’re driving unqualified traffic to your site and not making conversions, then all of your SEO marketing efforts are kind of for waste. So always bank before you think about how to rank, and one way that you can create valuable content and boost your sales and drive qualified leads with great copywriting made for conversions. Algorithms have become very sophisticated, in fact, Google hires thousands of psychologists and engineers to see how to align what people are searching for their needs and then how to get them to the right content. This is because it’s in Google’s best interest to always drive people to their search instead of the same consumer going to Facebook or Yelp, going to Twitter, things like that. To get your content found on Google, you can leverage LSI keywords. LSI stands for Latent Semantic Indexing, and you can use those keywords to make your content more relevant and more accessible to find on Google. 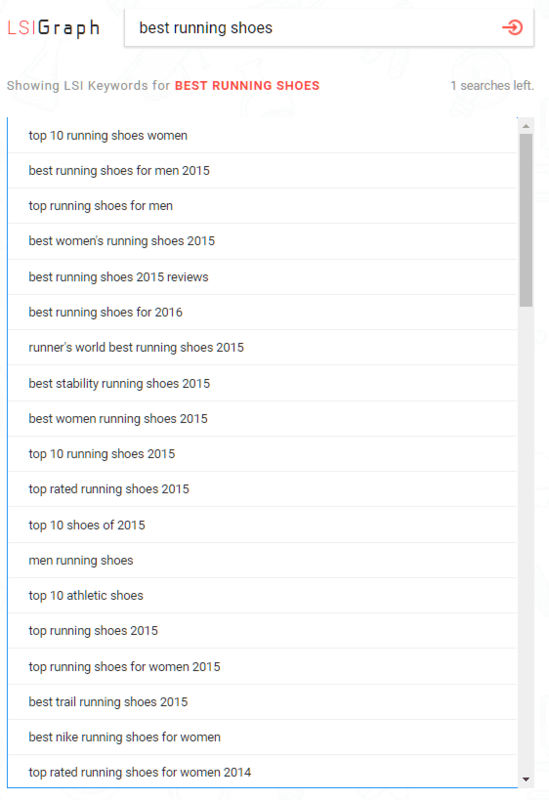 The best way that I could think of LSI keywords is whenever you go to Amazon, and if you type in running shoes, you’ll notice that running socks, running shorts, running books, other things like that also appear. 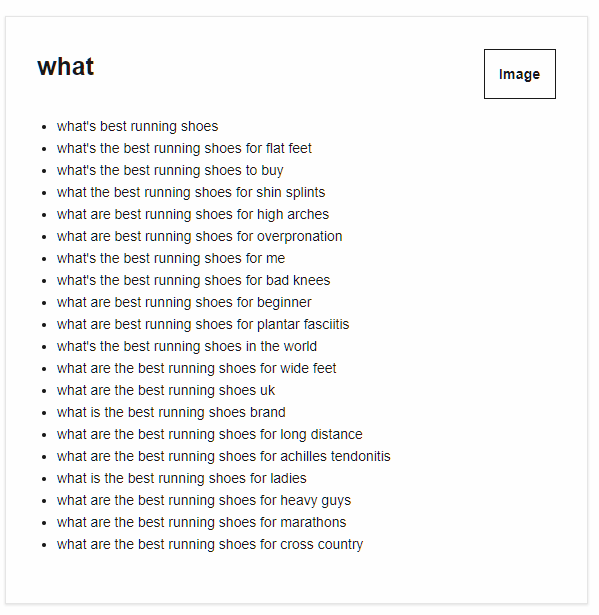 This is a type of LSI keyword algorithm in work because in this case, Amazon knows that people who buy running shoes also or might be looking for running socks. Thinking about it in the same way with your content and also use keyword variations. Don’t use the same keyword everywhere in your content and across your website because Google is going to notice that pattern and penalize you for it. Also, you’re not getting a wide enough footprint. So what LSI keywords and keyword variations within your content to see maximum results. But we’re also trying to get deep so that Google understands that we are the go-to source for the answers that we’re trying to communicate and our content. This is an example of LSI keywords. I like to use LSI Graph to find great LSI keywords to include in my content. It’s a free tool that you can use for your business or startup. Let’s just say we’re building a site about running shoes. I put in best running shoes in LSI Graph and then in about two seconds it retrieves a bunch of LSI keywords that I could think about using my content. There are some ways that you can that you can go about this and this, in turn, will make you have a larger essential word footprint. And also by using these different keywords with LSI Graph, you’re able to have a deeper connection with your audience, and that’s what Google’s looking for if you want to get ranked. Let’s look at how length and quality impact your content to rank; you got to run. There’s just no way around it. If you want to get on the first page of Google, you have to make consistent content that’s valuable and relevant to your audience, but that content also has to be pretty long. There are some studies that have shown that the average page one content on Google has over 2,000 words. While this isn’t a fast and robust rule as a general rule of thumb, so your content, the better you’re going to rank, and this is for some reasons. Regardless of content length, you can implement SEO copywriting tactics to grow your business without having to worry about getting penalized in the future! The most obvious reason for this is that longer content gives you a bigger canvas that you can work with and write content include LSI keywords include keyword variation, answer questions, provide you know, relevant content to your audience. Google likes all of these things and as a result in-depth content that’s longer, you will tend to get more links, and this content tends to rank better. This means that longer articles not only allow you more space to share information with your audience, you can also drive more relevant SEO marketing strategies too. You can make your content longer and go more in-depth by answering specific questions that your customers are asking. Think about what your customers need. Going back to the first point, what are they looking for? What are they searching for? What are their problems? How does your product or service address their needs? By expanding on those crucial points, you’re going to make your content longer naturally, and as a result, you’re to rank better. You’re also going to get more links, so always think about how to provide value and insight and length will follow. Each day, your competition is becoming more and more fierce, whether it’s large stores like Amazon or Walmart or other niche websites that are trying to take over and dominate your industry. You’ve got to continue to grow, and one of the best ways to do this is by dominating long tail keywords. While long tail keywords have lower competition in short tail, short tail or harder to rank for. The long tail is always going to be a more relaxed first approach, so even though you’re trading off the lower search volume, you’re going to be seeing more inferior competition and more qualified leads with long tail keywords, and this was just because long tail keywords are more accessible to rank for and convert your readers. I just have a list of some of a short tail keyword, Nike shoes and this one is pretty hard to rank for it. If I wanted to still go for Nike shoes, I could start thinking about how to improve my keyword footprint by using long tail keywords. These are just examples, but as you can see, these different long tail keywords still are associated with Nike shoes. The long tail keywords are particular, and they take into consideration the who, what, when, where, and why of my consumer. They’re going to be a little bit easier to rank for, and also they’re going to bring in more qualified traffic. The last part we want to look at is answering questions that your customers are asking. Answers are valuable, and people are looking for problems every time they go to Google as they type in a search query. It’s your job as a marketer, CEO, business owner to answer questions so people can see that they could trust you and that they should buy from you. Customers use items when they search for phrases like best Chinese food. Someone who uses this search query is asking, where’s the best Chinese food near me? You can use a similar approach to the example of Nike shoes. Think about the questions customers are asking related to Nike running shoes. What’s the best Nike running shoe for me? If you use exact match questions in your content, it’s going to allow Google to understand that your content is highly valuable to the needs of their audience. Since this is part of Google’s business plan, they’re going to connect the dots and rank your content higher. I always like to use exact match keywords and exact match questions in my content and not just on my FAQ pages. As a result, you’re going to be able to deliver credible answers to your customers, so they’re gonna continue to come back to you as a leading source and thought leader. This also results in relevant and valuable content with quality baked-in, so you’re not even trying to manipulate anything. You’re just using questions that people are asking. Putting those questions into your content and then giving answers, which is something you should already be using. All of these other words that qualify the needs of a consumer and if I were running a running blog, I would want to use these as a go-to source to not only answer my content. These questions are also great ideas for articles and other content for your website, so just look at the WHO, what, when, where, and why of your consumer and then look at the questions that they’re using and that they’re asking in Google to help guide you with your content creation. As promised, here are some more tools that you can use. SEMrush is a great way to find actual questions that people are using, and SEMrush offers some free means that you can use today. You just have to sign up for a free account to get started. It’s a little bit limiting, but it’s more than enough for whatever your needs are. You can also go to Google Trends to find out when people are looking for specific search terms, search terms, and this a way that you can integrate seasonal SEO into your content marketing. This is a great place to start to build your SEO marketing strategy and drive more sales. We looked at LSI Graph, it’s a free tool, and then also Answer The Public, which we looked at in the previous slide, and this is a great way to find specific questions that people are looking for based on a seed or a core set of keywords. You can also use a number of free small business marketing tools to help you find the questions and information your customers are looking for. So there you have it guys. We just looked over some actionable, no B.S. tips for great copywriting that you can use today for your small business or startup. Please go ahead and leave a like, comment and subscribe to the video. Also, share it with your friends because it helps us out a lot and until we talk guys again, thanks a lot for your time and we’ll see you soon!